As the old-time people knew, the Dutch post must be ‘seasoned’ (or cured) to keep it in tip top shape for years to come. If your old Dutch pot is starting to show signs of age and rust, scrub it well and use a fine-grade sandpaper to clean up and expose the entire surface, inside and out. Then wash the entire pot with hot soapy water to remove the fine metal dust remaining in an old dutchie. To cure a new pot, wash well with hot soapy water. This will remove the waxy coating from it. 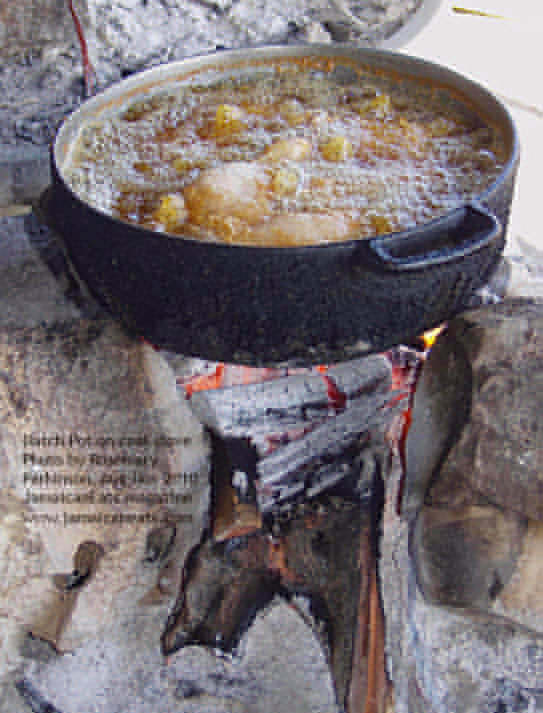 While the pot is still hot, pour or drop a small amount of oil, shortening, or lard. Wearing oven mitts or heavy leather gloves, use a clean cotton cloth to wipe the entire surface well, inside and out, to coat it with the shortening, oil, or lard. When it’s coated, heat it to 350° for an hour. After an hour of heating, let it cool slowly. Force-cooling a cast iron oven by putting it in a freezer, snow, or outside during a cold rain, can crack or warp it. Clean your dutch pot after each use by wiping a very light coat of oil, shortening, or lard over the dry, warm surface. By doing this you maintain and strengthen the cure. Over time the surfaces of the Dutch pot will blacken and become very smooth and shiny, and as non-stick as the best Teflon or other non-stick cookware available. Where possible, store the Dutch pot in a clean, dry place with the lid off to promote air circulation and avoid the smell and taste of rancid oil. Check the fit of the lid. It should lie flush with the lip of the oven all the way around, with no significant gaps. Check the casting, or thickness, of the metal, especially around the rim. There will be some inconsistencies. However, areas that are 15% (or more) thicker or thinner than the remaining areas will produce hot or cold spots during cooking and cooling. The variance in thickness will make it more likely to crack or warp. Ensure that the lid has a loop handle, cleanly attached to its centre.